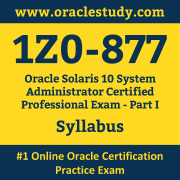 You can use this exam guide to collect all the information about Oracle Solaris 10 System Administrator Certified Professional Exam Part I (1Z0-877) certification. The Oracle 1Z0-877 certification is mainly targeted to those candidates who has some experience or exposure of Solaris 10 Administration and want to flourish their career with Oracle Certified Professional Oracle Solaris 10 System Administrator (OCP) credential. The Oracle Solaris 10 System Administrator Certified Professional Exam Part I certification exam validates your understanding of the Solaris 10 Administration technology and sets the stage for your future progression. Your preparation plan for Oracle 1Z0-877 Certification exam should include hands-on practice or on-the-job experience performing the tasks described in following Certification Exam Topics table. Validated Against This exam has been validated against Oracle Solaris 10, update 11. - Explain the Solaris 10 OS installation and upgrade options for CD / DVD, including how to provide Minimal Installations for SPARC, x64, and x86-based systems. - Perform an OS installation from CD / DVD for SPARC, x64, and x86- based systems. - Explain the Solaris 10 OS directory hierarchy, including root subdirectories, file components, and file types, and create and remove hard and symbolic links. - Explain disk architecture including the UFS file system capabilities and naming conventions for devices for SPARC, x64, and x86-based systems. - Use the prtconf and format commands to list devices, explain critical issues of the /etc/path_to_inst file and reconfigure devices by performing a reconfiguration boot or using the devfsadm command for SPARC, x64, and x86-based systems. - Given a scenario, partition a disk correctly using the appropriate files, commands, and options, and manage disk labels using SMI and EFI labels as they relate to disk sets. - Explain the Solaris 10 OS file system, including disk-based, distributed, devfs, and memory file systems related to SMF, and create a new UFS file system using options for <1Tbyte and > 1Tbyte file systems. - Given a scenario, check and resolve Solaris 10 OS file system inconsistencies using fsck, and monitor file system usage using the command line (df, du, and quot commands). - Perform mounts and unmounts on a Solaris 10 OS file system, and use volume management to access mounted diskettes and CD-ROMs, restrict access, troubleshoot volume management problems, and explain access methods without volume management. - Perform Solaris 10 OS package administration using command-line interface commands and manage software patches for the Solaris OS, including preparing for patch administration, and installing and removing patches using the patchadd and patchrm commands. - Given a scenario, explain boot PROM fundamentals, including OpenBoot Architecture Standard, boot PROM, NVRAM, POST, Abort Sequence, and displaying POST to serial port for SPARC. - Given a scenario, explain the BIOS settings for booting, abort sequence, and displaying POST, including BIOS configuration for x64 and x86-based system. - Execute basic boot PROM commands for a SPARC system. - Perform system boot and shutdown procedures, including identifying the system's boot device, creating and removing custom device aliases, viewing and changing NVRAM parameters, and interrupting an unresponsive system. - Explain the Service Management Facility and the phases of the boot process. - Use SMF or legacy commands and scripts to control both the boot and shutdown procedures. - Describe the purpose , functions and features of the Grand Unified Bootloader (GRUB), including how to modify x86 system boot behavior, manage GRUB boot archives, boot a system in the GRUB-based boot environment and interrupt an unresponsive system. Section 4: Perform User and Security Administration - Explain and perform Solaris 10 OS user administration, and manage user accounts and initialization files. Section 5: Manage Network Printers and System Processes - Control system processes by viewing the processes, clearing frozen processes, and scheduling automatic one-time and recurring execution of commands using the command line. - Given a scenario, develop a strategy for scheduled backups, and backup an unmounted file system using the appropriate commands. - Perform Solaris 10 OS file system restores using the appropriate commands, including restoring a regular file system, the /usr file system, the /(root) file system, and performing interactive and incremental restores for SPARC, x64, and x86 based systems. - Backup a mounted file system by creating a UFS snapshot and performing a backup of the snapshot file. - Restore data from a UFS snapshot and delete the UFS snapshot. - Describe how install, configure, and patch Solaris systems using jumpstart, Live Upgrade, and iSCSI. - Control and monitor network interfaces including MAC addresses, IP addresses, network packets, and configure the IPv4 interfaces at boot time. - Explain the client-server model and enable/disable server processes. Section 9: Manage Virtual File Systems and Core Dumps - Implement patch management using Sun Connection Services including the Update Manager client, the smpatch command line, and Sun Connection hosted Web application. Section 10: Manage Storage Volumes - Describe the Solaris ZFS file system, create new ZFS pools and file systems, modify ZFS file system properties, mount and unmount ZFS file systems, destroy ZFS pools and file systems, work with ZFS snapshots and Clones, and use ZFS datasets with Solaris Zones. The Oracle 1Z0-877 Certification Program certifies candidates on skills and knowledge related to Solaris 10 Administration products and technologies. The Oracle Certified Professional Oracle Solaris 10 System Administrator is granted based on a combination of passing exams, training and performance-based assignments, depending on the level of certification. Oracle 1Z0-877 certification is tangible benchmark of experience and expertise that help you stand out in a crowd among employers. To ensure success, Oracle recommends combining education courses, practice exam and hands-on experience to prepare for your Oracle Solaris 10 System Administrator Certified Professional Exam Part I certification exam as questions will test your ability to apply the knowledge you have gained in hands-on practice or professional experience.